A brand new level of interactivity is now available thanks to integrated touch technology. More flexibility and optimum simultaneous touch performance coupled with excellent operability opportunities give you the ultimate in user interaction. 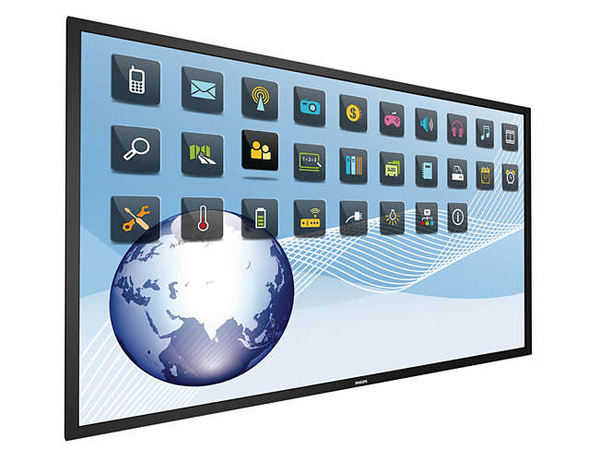 Multi-Touch displays are equipped with automatic touch recognition. The USB connector is HID-compliant, providing true plug-and-play operation. Keeping your content up and running is critical for demanding commercial applications. While it is unlikely you will face a content disaster, FailOver provides 24/7 protection with a revolutionary technology that plays back-up content on screen in the event of a media player failure. FailOver automatically kicks in when the primary input fails. Simply select a primary input connection and a FailOver connection and you're ready for instant protection. Be more flexible with your screen real estate. With the ability to play content from up to four separate inputs, all on one screen, QuadViewer is ideal for control rooms, corporate environments and meeting rooms. Our touch displays are software-independent and support Windows 8, Windows 7, Vista, XP, Mac OS and Linux.